3. Eljen a Magyar! Polka by Johann Strauss, Jr.
except Tracks 1, 3, 7, 12, 18, 19 & 23. All Drum Arrangements are by David E. Miles. Our CDs are available via PayPal and at all of our live events. They are also available at the following locations: Down Home Music (El Cerrito), Amoeba Records (Berkeley & San Francisco), Union Music Co. (San Francisco), A & G Music (Oakland), Bronstein's Music (South San Francisco), and Manor Music (Pacifica). The Victorian Dance is a collection of lively music that captures the flavor of the 19th century dance hall. 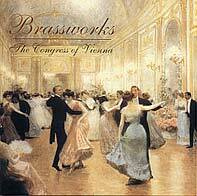 Performed by The Brassworks Band directed by Franklin Beau Davis, this CD offers a delightful selection of nineteen period pieces, ranging from the majesty of the Grand March to the whimsey of Forget Your Wife Waltz and the cacaphonous whirling--and accompanying screams--during Sellenger's Round. Besides such fun, The Victorian Dance provides an aural window into the past. The seldom-performed and rarely recorded Sir Roger de Coverley is of historical importance as the only dance tune mentioned in all of Charles Dickens' literature. This music is played as the Ghost of Christmas Past shows Ebenezer Scrooge a Christmas party at Fezziwig's warehouse. arranged by Franklin Beau Davis. All Drum Parts arranged by David E. Miles.